I’ve posted a couple of variants on meringues, but these were our prettiest yet, deserving of their own post. 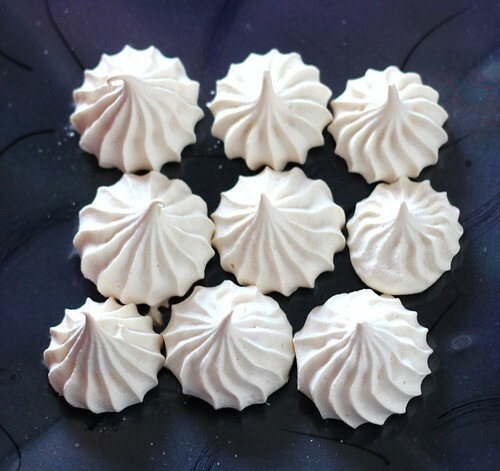 Plus, these meringue cookies make for a quick and easy gluten-free, dairy-free Passover dessert, requiring no special equipment or ingredients — pretty much just eggs, sugar and a mixer. When I first started this blog in 2010, I posted a recipe for chocolate-chip and double chocolate meringues, with a really ugly photo, before I learned that you never, ever want to use a flash for food photography. And I also previously posted a recipe for cute ghost meringues for Halloween. Meringues are true sugar cookies because the main ingredient is, well, sugar. My youngest daughter is crazy for them. Using a mixer, beat egg whites on high speed until foamy. Add cream of tartar and salt, and beat until stiff. Gradually add sugar and continue beating. Beat in vanilla extract. Put a large star tip on a disposable pastry bag. Fill the bag with the meringue mixture and twist the top to close. Pipe the meringues onto the lined baking sheet. Bake for one hour. Allow meringues to cool and store in an airtight container. 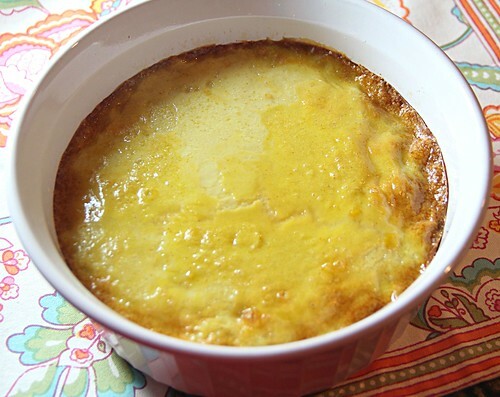 This custardy corn pudding is gluten-free and dairy-free, a perfect Thanksgiving side. I am continually impressed by the wealth of content at the Joy of Kosher site. So when they asked me to develop a corn pudding recipe for Thanksgiving and Hanukkah, I was thrilled. I wanted to make a creamy corn pudding that was dairy-free, as well as gluten-free, so it could be served with a kosher Thanksgiving dinner. The eggs give the pudding a light, soufflé-like consistency, studded with nuggets of golden corn. It may seem fussy to bake the pudding in a water bath, but I tried this recipe both with and without a water bath. I found that using a water bath (baking the dish set in a larger pan surrounded by hot water) is the way to go. It insulates the soufflé, cooks it evenly and gently, and prevents it from falling and deflating. On this Thanksgiving, that’s something to be thankful for. You can find my full corn pudding post on the Joy of Kosher site, along with the accompanying recipe. 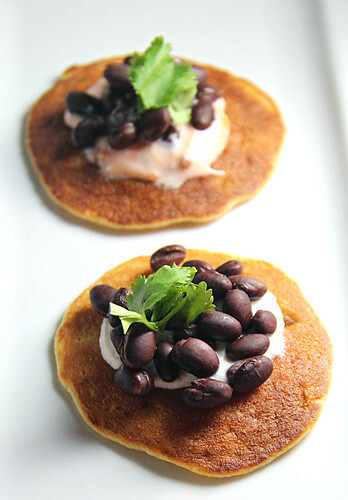 Thanksgivukkah corn pancakes, topped with sour cream, black beans and cilantro. Because of a rare quirk in the calendars, this year Thanksgiving and Hanukkah overlap, giving rise to the once-in-a-lifetime holiday of “Thanksgivukkah.” The unusual occurrence has inspired riffs on the holiday like “menurkeys” (turkey-shaped menorahs), funny T-shirts (a turkey holding a sign that says, “Eat latkes”), pithy sayings (“Gobble tov!”) and of course fun food combos (latkes with cranberry applesauce and pecan pie rugelach). 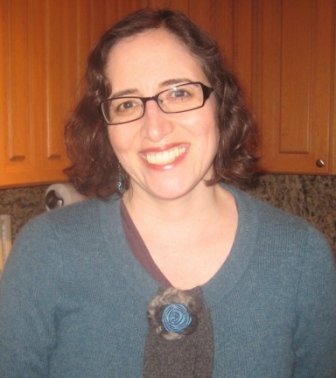 Thanksgivukkah — now that’s meshugenah! Not only is Thanksgivukkah fun to say, it’s fun to celebrate, as well. There is something to be said for enjoying both holidays with family and friends, honoring liberty and latkes at the same time. (Disclaimer, it may be more fun for me, because I am not hosting it at my house. Thanks, Josh and Jonna!) And with Hanukkah out of the way early, I’m looking forward to taking December easy, relaxing while others are stressing out about shopping, and— best of all — avoiding stores with cloying Christmas songs on a continuous loop. Consider getting into the Thanksgivukkah spirit with meals that combine some traditions of each holiday. While nothing will take the place of potato latkes, try mixing it up with these gluten-free Thanksgivukkah corn pancakes. The corn pancakes are cooked in a little bit of oil, recalling the oil in the Hanukkah story, yet feature the Thanksgiving staple of corn. Topped with sour cream and black beans — or for a non-dairy option, a mix of black beans, corn and salsa — the festive pancakes can be served as appetizers before a Thanksgivukkah meal, or for a Hanukkah lunch or brunch. Let us know what you are doing to celebrate Thanksgivukkah by leaving a comment. Today, a fall rainfall brought down a cascade of leaves from the maple tree in front of our house. In shades of gold, bronze, ocher and amber, the leaves fell, thickly carpeting the sidewalk. In weather like this, I crave the comfort of a warm bowl of soup. And what better soup than a perennial fall favorite: butternut squash soup, made gluten-free and dairy-free. For a while, I was turned off by butternut squash soup, with its one-note sweet taste and pablum texture. But that’s certainly not the case with this complex honey-roasted butternut squash soup, laced with the smoky spice of chipotle chile pepper and the slightly exotic taste of cumin. What’s even better is that this butternut squash soup is gluten-free, dairy-free and vegetarian, making it well-suited for a variety of people (except for my kids; shall I admit that they don’t like this grown-up soup?). For a vegan version, use maple syrup instead of honey. Preheat oven to 400 degrees. Line a large rimmed baking sheet with aluminum foil, and spray the aluminum foil with cooking oil. Place butternut squash, carrots and red onion on the baking sheet, and toss with honey, olive oil, cumin, chipotle chile pepper and salt until well coated. Bake for 40 minutes or until vegetables are tender when pierced with a fork. Place roasted vegetables in a large soup pot and add vegetable broth. Bring broth to a boil, reduce heat to low, cover and simmer for 15 minutes. 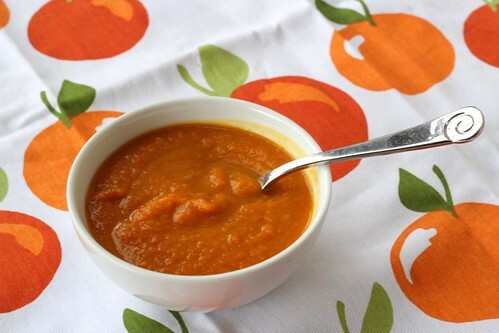 In batches, carefully pour soup into a blender and puree until smooth. Do not fill blender to the top, and hold down the lid with a kitchen towel to prevent spattering. Transfer blended soup back to pot and heat before serving. 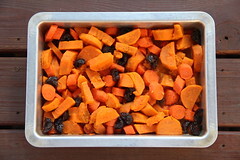 Following is a collection of root vegetable recipes from The Kosher Connection link-up. Please note that not all the recipes in the collection are gluten-free.